Increasing flight altitudes of commercial airliners and growth in the business jet and combat drone sector lead to a decrease in Reynolds number compared to the operating conditions of aircraft engines used today. Decreasing the Reynolds number generally leads to higher aerodynamic losses and thereby the fuel consumption of the engine is increased. The performance of the low pressure turbine is of particular importance as it drives the fan which generates up to 80 % of thrust in a modern high bypass ratio aircraft engine. For a large commercial bypass engine, the performance penalty in the low pressure turbine is about two percentage points from takeoff at a Reynolds number Re ~ 200,000 to cruise at Re ~ 80,000 and might be up to seven percent for military applications. Low pressure turbines feature high aspect ratio blades. Consequently, 2D aerofoil loss is the largest contributor to total loss. Approximately 2/3 of the aerofoil loss is generated on the suction side. At the low Reynolds numbers encountered in a low pressure turbine, the laminar boundary layer is likely to separate in the adverse pressure gradient region on the suction side. The size of the separated zone and the associated generation of loss are determined by the transition from laminar to turbulent of the separated shear layer. 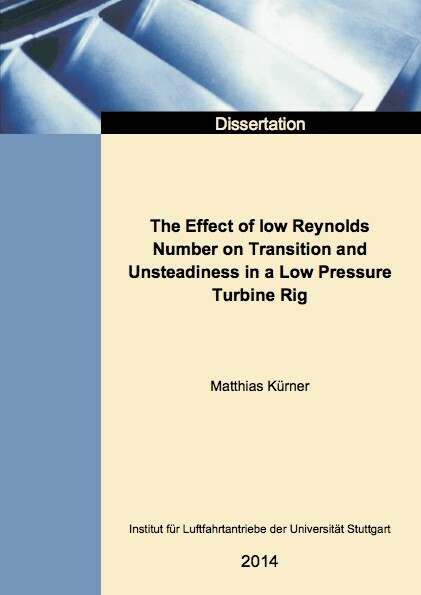 To investigate the effects of low Reynolds number on low pressure turbine performance, a new two stage axial flow low pressure turbine has been designed by MTU Aero Engines AG. The so called Advanced Turbine Research and Demonstration (ATRD) rig operates in the Altitude Test Facility at the Institute of Aircraft Propulsion Systems (ILA) at Stuttgart University. This test facility allows the preservation of both Mach and Reynolds similarity for the turbine flow. The turbine under investigation represents the flow field encountered in an aircraft engine at high altitude cruise. In the present work, the unsteady boundary layer behaviour on the suction side of the second vane and the associated unsteadiness downstream the blade row at midspan are analysed. Reynolds numbers based on the exit velocity and the true chord length of the second vane ranging from 88,000 down to as low as 35,000 are investigated. Measurements include isentropic efficiency of the turbine, aerofoil pressure distributions, flow visualisation, surface thin film gauges at midspan of vane 2 suction side and 2D hot-film probe traverses at vane 2 exit.